On the basis of his speech of August 17, 2014 evening, Dr. Tahir-ul-Qadri has emerged to be a selfless patriotic leader with a vision never put to explicit expression by any other big or small leader in the history of Pakistan. Every single sentence of his speech clear headedly explains the highly destructive aliments that have crept into every nook of social system of the country exclusively due to political mishandlings of state’s affair. He has concretely pointed out the faults and side by side these he has diligently suggested the practical devices for sure cure. Minutely going through his whole speech no sensible mind can doubt the force of practicability of treatments suggested by him. Dr. Tahir explains that the very foundation of the so called democratic system is based on playing havoc with the resources of the country which are adequately sufficient for successfully running of the state’s affairs for the welfare of the citizen as well as for the welfare of international community. Pakistanis don’t need to approach foreigners, including friendly countries, for debts and alms. If we nip corruption, misappropriations and embezzlements, the country can be brought to a status in which it can financially help poor countries of the world purely on humanitarian grounds without any aim of greed and gain. Dr. Tahir-ul-Qadri has gone into details how the benefits will reach the citizen in the remote areas of the country where people are living the lives of minorities irrespective of religion and belief. The arrangements explained by him sound practicable and doubtlessly beneficial results are imminent. At present in some of the remote areas foreign missionaries are helping the people in health matters. The staff of these missionaries in not well qualified, still they are helping the people especially the remote area ladies who are listened by ladies health workers. One of such clinics is at Besham (NWFP) where a foreigner lady examines ladies patients, for only a few days during the month. Major part of expenses is donated by the foreign country of the lady health worker whereas some local philanthropists also donate. The ladies come down from the hilly areas for the days, during which medical checkup is done. Condition of people of remote areas of Sindh and Baluchistan is highly pitiable. Dr. Tahir-ul-Qadri’s agenda and programs have striking components of feasibility. It is skies away from being hypothetical. Every citizen residing by every stone and every sand dune has to be approached for help he needs. Presently remote areas people are treated as if they are not citizens of this state. Nobody wants to listen to them except for vote bank. Politicians especially avoid them. Democracy is not at all the universal pill that cures all diseases of all patients on earth. Every society has its own norms as well as its own temperaments and habits. In Pakistan deliberate embezzlements and loots are termed as democracy. Politicians have classified luxurious lifestyle to be the source of honour and dignity whereas for its factual definition, luxury is the mother of all evils, crimes and suppressions. 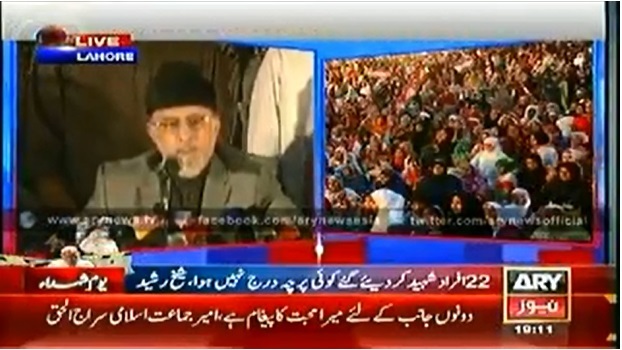 Dr. Tahir-ul-Qadri’s suggested system of governance is the essence of Ideology of Pakistan. No other leader has so far suggested a program nearest to the Ideology of Pakistan. You meet his party members and workers, they are the personification of the ideology of Pakistan for which we sacrificed honours and lives not in past history. And mind you ladies and gentlemen that Ideology always remains unaffected by the passage of time. Time will always remain subject to Ideologies till eternity. If you don’t listen to Dr. Tahir-ul-Qadri, you don’t listen to Pakistan and you don’t listen to people of Pakistan who form the nation. During 70 years period, politicians have been fighting for grabbing the power chairs for usurping the resources of the country for their own securities, luxuries and welfare of their families. Just judge selflessness of Dr. Qadri, see stunning discipline of his party members and workers. Everything only speaks for the Ideology and for the people of Pakistan, especially the poor and unemployed.